The right know-how when it comes to landscaping and construction can save you a serious amount of cash. In particular, learning to pour concrete with professional efficiency will save you time and money across a wide span of projects. So that’s what this blog is all about. It’s concrete pouring 101. What Concrete Should I Use? Ready-mix concrete, which will save time on small projects at a premium price. Transit-mix concrete, a professional service using trucks with revolving barrels. Mix-it-yourself concrete, the cheapest but most labour intensive option. For each of these options, we recommend shopping around to find the best price. Ultimately, the size of your project, labour capacity, and budget will determine the right option for you. Before you can pour your concrete, you should provide a framework within which you would like your concrete to set. You’ll need to excavate the location you wish to use, and construct an accurate frame that accurately represents the angle and dimensions of your desired end product. You must also prepare what’s known as a subbase. The subbase is the underlying material upon which your concrete mixture will sit. We recommend using fine-grade stone, as this will protect your concrete from shifting and cracking. Water (preferably filtered, and free of acidity, alkaline, oil, and sulphate). One part Portland cement. Two parts sand. Four parts gravel. Water is used as a binding agent. The more water, the more manoeuvrable your concrete mixture, but the more prone to cracking the finished product will become. Assuming your project is small and you’re mixing in a wheelbarrow using a trusty trowel or shovel, you should continue to add water until the mixture becomes smooth and consistent. 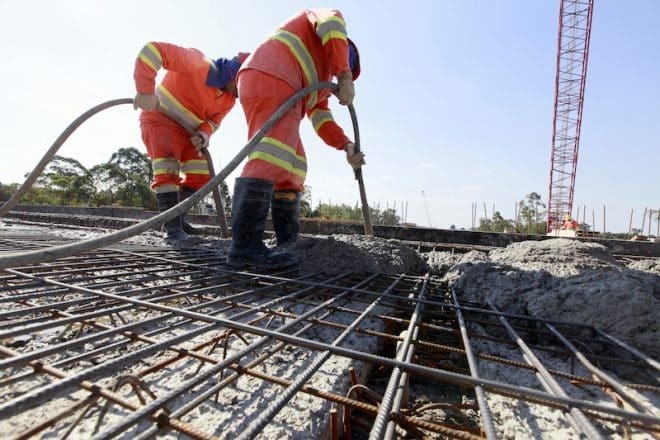 This can be heavy work for even particularly fit and strong people, so take caution and consider the full array of concrete mixing options open to you, including the hiring of professionals. Before you set off, you should be aware that certain weather conditions are more conducive to pouring concrete than others. A combination of direct sunlight and hot weather can make your concrete cure too swiftly. This can cause cracks. If the weather is too cold, your concrete will not set properly. Ideally, then, you should pour your concrete in a period of moderate temperature, ideally between 5-25 degrees Celsius. Tip the concrete from your wheelbarrow until you’ve entirely filled your prepared area. Ensure your concrete is flat, with clean edges. A wooden board can be used to this end. Scrape it across the surface as many times as necessary. If you cannot reach across the surface, then a concrete rake can be employed. Float your concrete. Once your concrete is level, take a floating device and apply pressure to your surface, which will serve to aid the gravel-free concrete rise to the top. Once completed, leave to partially harden. Be careful, as this process can occur in a matter of hours depending on weather conditions. Cut grooves into your concrete. These must be cut every 1.6 to 1.8 metres. You can use a plank to provide the straight edge you need, then cut the grooves to about ¼ of the thickness of your concrete. Traction may now be created by using a broom, trowel, or soft brush. This will prevent your concrete from becoming too slippery when wet. You can create designs like this, too. Note that if passing your broom over the concrete causes clumping, then your concrete has not been allowed to set for long enough. Cure and seal. Professionals recommend sealing your concrete the day of pouring. After roughly four weeks, your concrete should be ready for use. Re-apply your seal every 3-5 years for optimum longevity.